Human eye is very sensitive part of the whole body and usually human beings develop different types of vision difficulties as the age goes by and some young people also get eye related problems because of nutritional deficiencies, hereditary, etc. There are three types of vision defects based on the distance of the object that a human eye can see properly. These vision problems are corrected with the help of different methods like wearing eye-glasses, contact lens, laser treatments etc. The different types of vision defects are as follows. Myopia is a condition in which the people cannot see objects which are beyond the ‘far point’. Far Point is the point of maximum distance at which the eye lens can form an image on the retina. Myopia is also called as’Near- Sightedness’, in which person cannot see the far objects clearly but can see the near objects clearly. The Myopia can be corrected using Double-Concave lens. EXAMPLE: A student who is unable to see the letters on the classroom board is suffering with Myopia. Hypermetropia is a condition in which the people cannot see objects placed between the ‘Near point’ and the point of least distance of distinct vision. ‘Near Point’ is the point of minimum distance at which the eye forms clear image on retina. Hypermetropia is also called as ‘Far-Sightedness’ because the individual cannot be able to see the near objects clearly, but can see the far objects clearly. The Hypermetropia is corrected using the Double- Convex lens. EXAMPLE: An old person, who is not able to read the newspaper is suffering with hypermetropia. Presbyopia is a vision defect caused due to ageing and weakening of ciliary muscles, diminishing the flexibility of eye lens. A person with this defect cannot see nearby objects and as well as far objects clearly. Presbyopia can be corrected using bi-focal lens with both concave and convex lens in it. 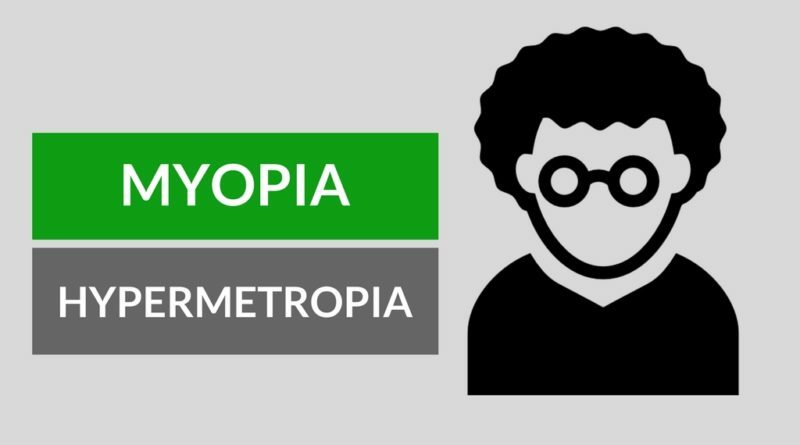 There are many differences between myopia and hypermetropia, some of them are as follows. Myopia is also called as Near-sightedness. Hypermetropia is called as Far-sightedness. In Myopia, the person can see nearby objects, but cannot see far objects clearly. In Hypermetropia, the person can see far objects clearly, but cannot see near objects clearly. In people with myopia, the image is formed in front of retina in the eye. In people with hypermetropia, the image is formed behind the retina in the eye. The size of the eye-ball increases in the myopic people. The size of the eye-ball decreases in the hypermetropic people. In myopia, the focal length of the eye lens decreases. In hypermetropia, the focal length of the eye lens increases. Myopia can be corrected using Double-Concave lens. Hypermetropia is corrected using the Double-Convex lens. The vision defects are corrected using different types of lens and the lens have different powers like negative power lens and positive power lens, etc. which are very commonly used lens to correct the vision problems of the people by wearing spectacles.